Heroes and villains, birds of a feather, oil and water – father and son. Erik de Waal explores the rocky, sometimes exuberant relationship between two men who share the same blood and often very little else. By the end of this one several people in the audience had gotten out their tissue to mop up tears. This is a heavy, but nostalgic view of an apparently incredible man, and this show does him justice and then some. 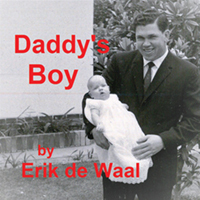 We are taken gently through the life of Erik’s father from his birth, to his father’s death, and it paints a stunning picture of a man who loved big, and loved hard, and wanted out on his own terms. My only regret is that I never got to meet him.